Realms, an imprint of Christian book publisher Charisma House, announces Sarah Price’s next book, First Impressions, which is an adaptation of Jane Austen’s Pride & Prejudice. First Impressions is due for release in bookstores on May 6, 2014, and it is also available for pre-order now on amazon.com, walmart.com, and BN.com. 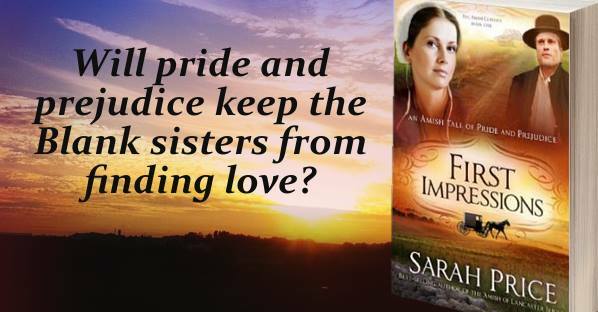 Set in Lancaster County, Pennsylvania, book one of The Amish Classics series, is a retelling of Pride and Prejudice, covering the same issues of manners, upbringing, morality, education, and marriage within the Amish community. SERIES DESCRIPTION: The Amish Classics Series is a retelling of novels by Jane Austen in a contemporary Amish setting. The main story lines are accurately followed but told within the Amish culture and religion. Can’t wait to get this book.